After England’s loss to Scotland, coach Eddie Jones spared his players by publicly taking the blame for the loss. It was a classic move designed to make his players feel like the boss had take one for the team and they had better repay his loyalty. However, in the lead up to the French test the crafty old fox then made some changes to his team – designed to send a message to his troops. The change of captain from Dylan Hartley to Owen Farrell was forced due to injury, but the move to play Anthony Watson at fullback and drop Mike Brown was not. Jones took a punt to upgrade the strike power of his back three by selecting Watson, Elliot Daly and Jonny May. Let’s hope he gives them time to gel. 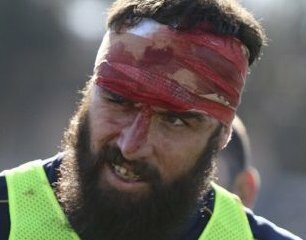 Anyone who follows international rugby will tell you that France can beat anyone on their day (including the All Blacks), but nobody can ever be sure which French team will turn up. Unfortunately for England this French team turned up and imposed themselves physically. This clip is a great illustration of France’s intent. Have a look at the size and power of the French flanker Yacouba Camara and watch how many times George Ford gets knocked around in the space of 30 seconds. Yes indeed the French turned up to play. The only Englishman on the planet happy to see Watson yellow carded early in the second half would be Brown. 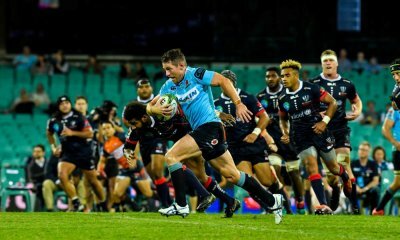 Watson was unlucky to concede a penalty try for a high tackle that stopped the French winger Benjamin Fall from scoring. After Francois Trinh-Duc chipped a beautifully weighted cross kick to his left winger Remy Grosso, Watson was desperately trying to defend his line. This try in the 48th minute was a key moment in the game as France built a 10 point lead (19 v 9). With England down a man for the next 10 minutes, Jones was forced to go the his bench looking for answers to break down the solid French defence. As Jones flooded the pitch with fresh legs, England finally struck back to turn the game into a grand stand finish. Watch the start of the clip and see Daly signalling to Owen Farrell that there was space on the left edge. With Ford now off the park it was up to the new captain to get his team back in the match. Farrell’s 20m pass to Daly was exceptional and May ran a good support line to bring England within 3 points of the French (19 v 16). In the previous try it was the French wingers combining on the left edge to score and in this clip it was the England wingers’ turn. With so much riding on the game for England it was fitting that they’d have a chance to secure victory and keep their chances of sharing the championship alive. In fact England had a couple of shots gifted to them by France after the 80 minute mark, but they simply could not get it done. 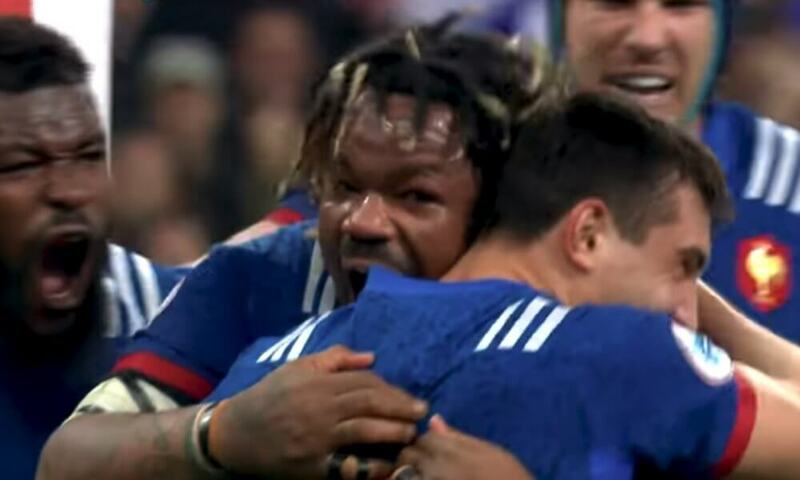 France defended well all day and in the dying stages of this epic battle it was the enormous French centre Mathieu Bastareaud who came up with another steal to save the game for France. It was probably the 5th ball he turned over in the game and it was fitting that he came up with the play because he was clearly pumped up all game and he gave everything he had for the full 80 minutes. It will be interesting to see what tricks Eddie Jones has this week to get his team up for the final match v Ireland at Twickenham. Up until a few days ago it was unfathomable to think that Ireland could win the Championship with a game in hand. Now they have the chance to humiliate England by winning the Grand Slam at the home of English rugby. It’s going to be an incredible contest. Will Ireland be ruthless and drive the blade into the heart of the English team or will England find the will power to restore some pride in the white jersey? All I know is that I love the Six Nations! 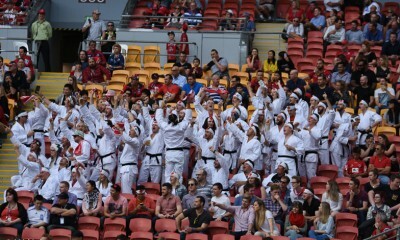 Get Your 7s Fix Sydney! 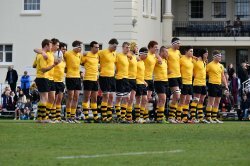 The Scots College Rugby 7s tournament is often a highly anticipated fixture on the college’s Rugby calendar, and 2018 is set to be no different. With schoolboy teams from Australia, Fiji and New Zealand competing for the Pillinger Cup, this year’s event looks to showcase great young rugby talent through the fast-paced style of rugby sevens. 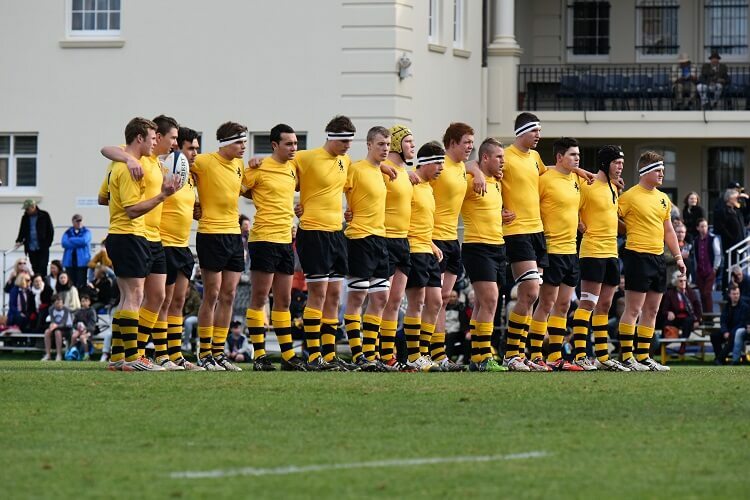 In attendance at this year’s tournament, taking place on Saturday 7 April 2018, are Canberra Grammar School, NSW Development Squad, Newington College and The Scots College, who all make up Pool A. Pool B consists of Lloyd McDermott Rugby Development Team, Ratu Kadavulevu School (Fiji), St Ignatius’ College Riverview and Trinity Grammar School. The first match of the day will kick-off at 11:00am, with the finals to begin at 3:15pm after the Rhino Sprint 100m race at 3:10pm. The presentation ceremony concludes the day and will start at 4:45pm. Tom Fordyce (BBC News): “One side now sits a game away from only a third Grand Slam in their history. The other is lurching into something that if it isn’t quite a crisis, is starting to look rather like one.”. Did Tom steal this quotes from Hugh Cavill? Well, I’ll if a 90-odd win percentage represents the cusp of crisis for Jones, Cheika’s post-world cup mid-40’s achievement obviously has patiently queueing at Centrelink. Tom Fordyce (BBC News): “These habits are not happy accidents. In this championship Ireland have now garnered 24 points when time has been up – those fateful three in Paris, 14 against Wales, seven more as they sealed the title against Scotland.”. 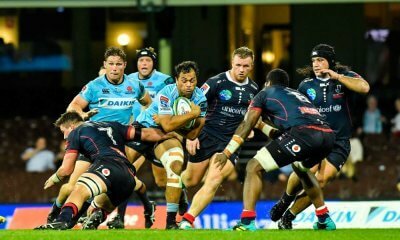 Has anyone forwarded these clips to Darryl Gibson with a note “see the effectiveness of big forwards”? Or any NH team… or in fact, any of the Tah’s opposition so far as well. And on form to date they are in for some more rag-dolling next week too! Brian, Thanks for the write-up. Allez les Bleus and go Ireland. Good stuff again Brian. For England the match was very disappointing; however for me not a huge surprise. All season they have struggled at the breakdown and have lacked forwards providing real go-forward. I think the loss of Ben Youngs at scrum half has hurt them badly too. Danny Care is good (although for me, at his best as a “Finisher”) but the new “Finisher” is Richard Wigglesworth – great at club level but very pedestrian at Test level. Throughout the match England looked unlikely to score tries. France played fairly well. 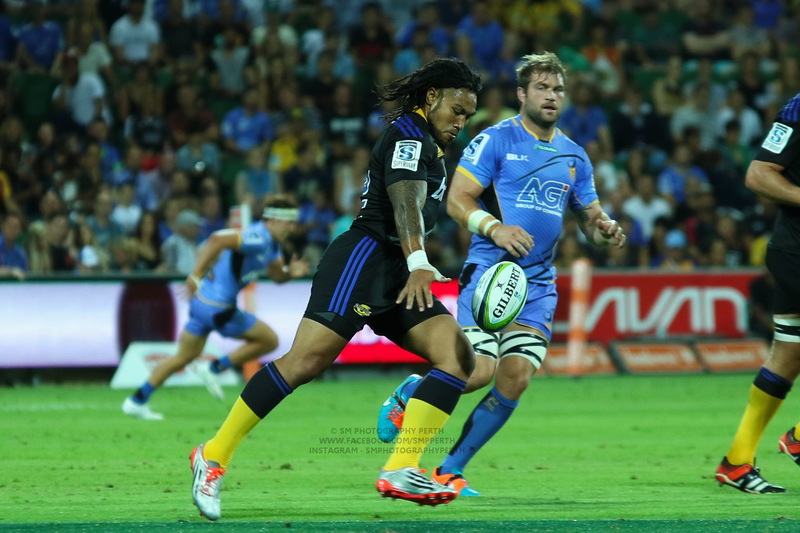 Bastareaud is in great form – offloads and jackals to go with the physical threat. I think Trinh-Duc is an improvement on Beauxis. However they are not yet a “team that can beat anyone on the day”.